A deadly strain of hydrophobia is spreading through the area. Some of Chipper's friends are sick. Little Jonathan introduces Chipper to his brothers, Blake and Wesley. They search far and wide for the elusive ingredients required for a cure. Evil John Henry IXL Baldo Leach sends his cronies to wreck the lab and steal the existing formula. Tip is very sick and is sinking fast. Read Book Seven and learn why children of all ages eagerly follow the Adventures of Chipper. 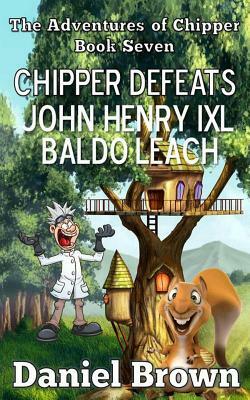 Chipper Defeats John Henry IXL Baldo Leach was published by Chipper Defeats John Henry IXL Baldo Leach in June 2014. The ISBN for Chipper Defeats John Henry IXL Baldo Leach is 9781941622018. Be the first to review Chipper Defeats John Henry IXL Baldo Leach! Got a question? No problem! Just click here to ask us about Chipper Defeats John Henry IXL Baldo Leach.